MySQL and PostgreSQL-compatible relational database with 5X performance. Security, availability, and reliability of commercial databases at 1/10th the cost. Amazon Aurora is a MySQL and PostgreSQL-compatible relational database engine that combines the speed and availability of high-end commercial databases with the simplicity and cost-effectiveness of open source databases. Amazon Aurora provides up to five times better performance than MySQL with the security, availability, and reliability of a commercial database at one tenth the cost. Watch a step-by-step guide on creating your first database cluster on Amazon Aurora. Choose an instance type based on performance characteristics, launch a database instance, and then connect to the database from a MySQL client. Amazon Aurora makes it simple and cost-effective to set up, operate, and scale your new and existing MySQL and PostgreSQL deployments, thus freeing you to focus on your business and applications. In this getting started project, you will convert the schema, migrate from the source to the target, and run SQL to validate the objects and tables. You can begin the data migration with just a few clicks in the AWS Management Console. 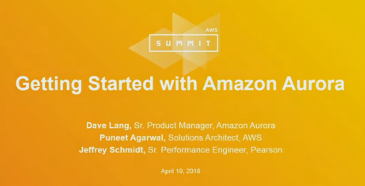 In this session from the 2016 Chicago Summit, we introduce you to Amazon Aurora, explain common use cases for the service, and help you get started with building your first Amazon Aurora-powered application. This whitepaper discusses the best practices and the step-by-step process for migrating open-source and commercial databases to Amazon Aurora with minimal disruption to the applications that are using the database. Gain a basic understanding of using Amazon Aurora through this guided hands-on lab covering the steps needed to create and connect to an Amazon Aurora instance. Linda Xu, data architect at Ticketmaster, walks you through Ticketmaster's journey to Amazon Aurora, starting with evaluation through production migration of a critical Ticketmaster database to Amazon Aurora. Ticketmaster is one of the world's top 10 e-commerce companies and the global market leader in ticketing. In this session, Linda discusses how Aurora lets Ticketmaster provide better services to their fans, customers, and clients, and helps reduce the cost and operational burden while giving greater flexibility to support heavy traffic spikes. It's easy to get started. Follow our Amazon RDS Getting Started Guide to create your first Amazon Aurora instance with just a few clicks. Want to know more? 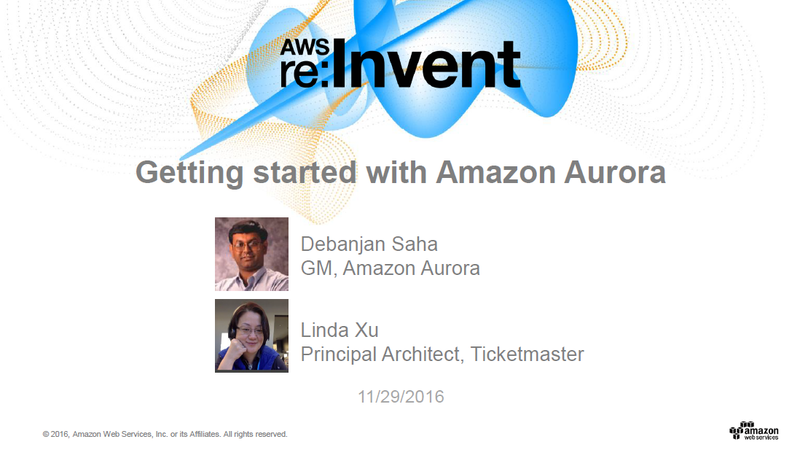 Visit the Aurora product page, or drop our AWS experts a line.